There are plenty of other Halloween cocktails out there deserving of being stirred up on Halloween that don’t necessarily incorporate pumpkin. Here are a few adaptations of beloved cocktails that may be perfect to accompany the Halloween party you’re hosting this weekend. The name is derived from the 1920’s movie of the same name. Many argue the drink’s equal proportions and – to eliminate a level of ‘sweetness’ – often double the serving of scotch. Shake all ingredients well and strain into a cocktail glass. Garnish with flamed orange zest. Adapted from a classic Sidecar, this Cidecar tones down the level of sour while amping up the fall flavors with a smooth, vanilla-forward cinnamon schnapps. 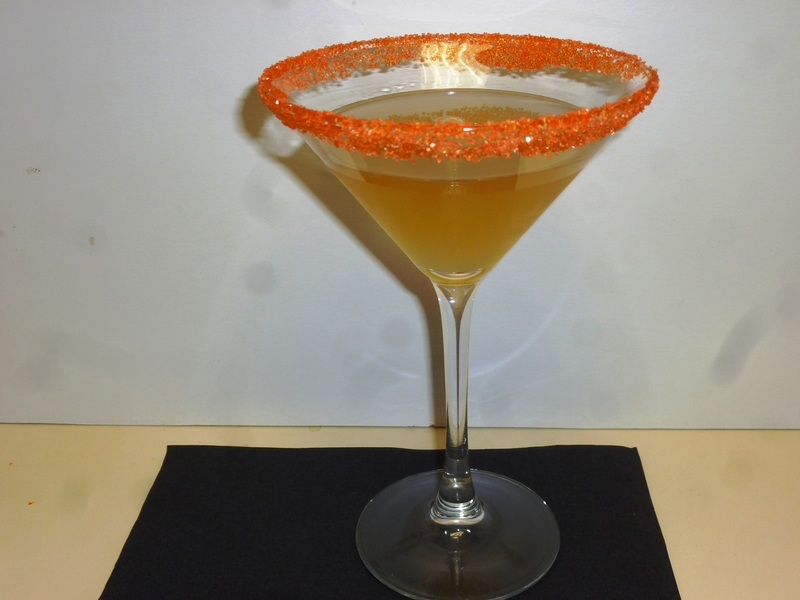 Another Halloween addition – find orange crystal sugar for the rim of your cocktail glass as I did in the photo below! The original recipe dates back again to the 1920s in Paris. Hiram Walker Cidecar in the Nova office. I like the sort of "Angel's share" glow happening in the photo, too! Shake with ice, and serve up in a sugar-rimmed chilled cocktail glass. Also, did you notice the picture at the beginning of this blog post? 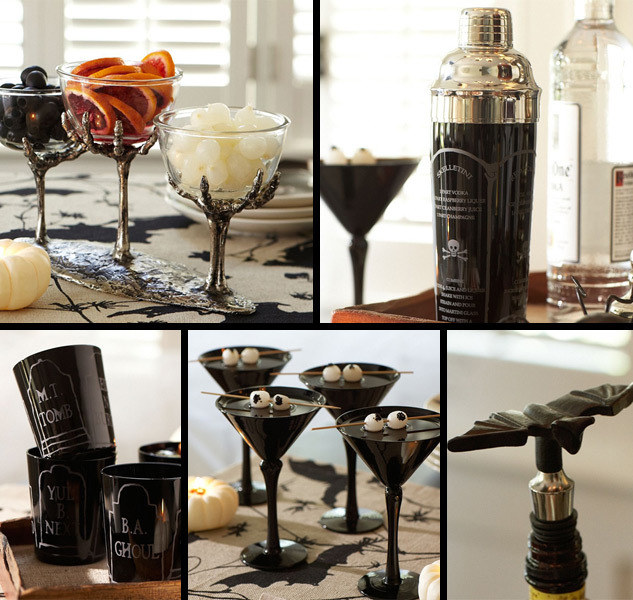 The website WhatToDrink.com sent out a Halloween newsletter with these great home decor tips to liven up any Halloween house party. I would love to get my hands on the skeleton garnish bowls! Before jumping into the realm of Halloween cocktails (yup, Cocktail Culture’s got ’em for you, stay tuned! ), I wanted to pay homage to October for being more than just a love-fest with pumpkin. Oh, no! October is actually National Apple Month and deservedly so; Connecticut, as I’ve come to realize, is abundant with apple picking festivals throughout the month (CTbites.com is a great resource for all of your CT festival and event needs). Mix ingredients in a shaker with ice. 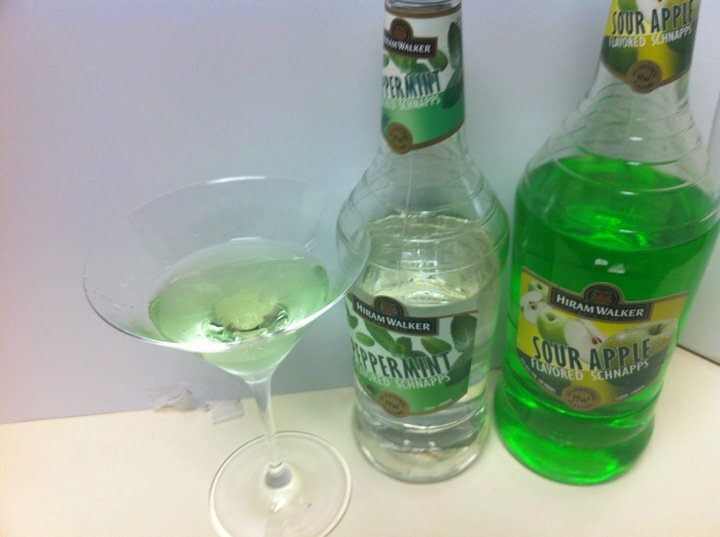 Strain into a martini glass and garnish with a slice of apple. Although we didn’t have the appropriate apple garnish on hand, this recipe ended up being quite the afternoon delight. The nose permeates of apples, the booze goes down smoothly (two coworkers failed to even recognize the taste of vodka in the cocktail! ), and the finish leaves your mouth with the cool, tingly sensation of spearmint. 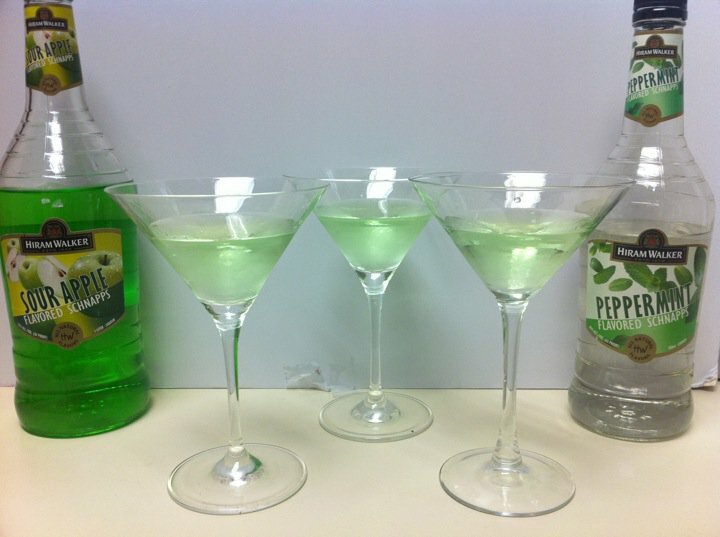 I must say, the Icy Apple Martini has quite the complex flavor profile for being such a Simple-tini! Give this recipe a try or share some of your other favorite fall recipes in the comments section! Today is National Liqueur Day! 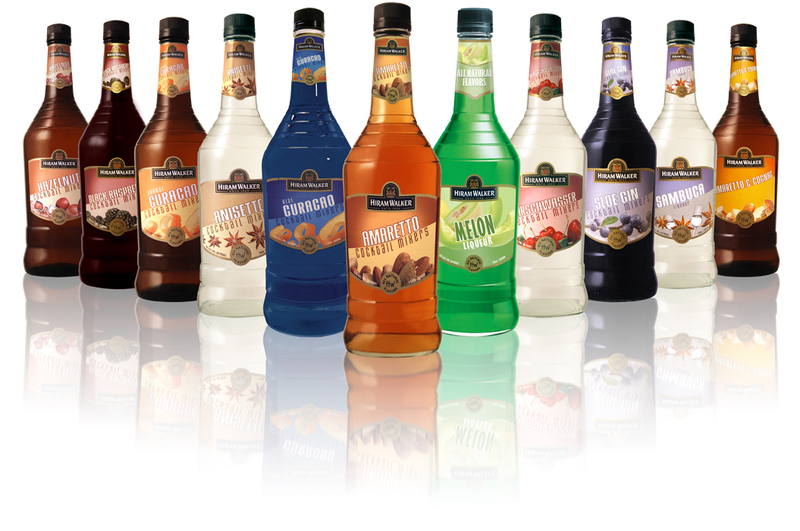 To celebrate, why not take your pick of one of the over 30 all natural flavors in the Hiram Walker portfolio of liqueurs, schnapps, and flavored brandies. Serve over ice, garnish with an orange and cherry flag. With so many flavor profiles to enhance your back bar, I want to hear from you what your favorite Hiram Walker product is. Leave me a comment and tell me about your favorite Hiram Walker flavor. I’ll tailor a recipe in a blog post next week for every reader comment I receive before Monday at 11:59 pm (EST). Enjoy celebrating National Liqueur Day! Cheers! I fear sounding too repetitive, but I was giddy with excitement when I opened my inbox early this week and saw Colleen Graham’s About.com Cocktail Newsletter. In it, she announced October’s cocktail contest which – as you can deduce from the title of this post – is Cinnamon! “Your drink can use fresh cinnamon, cinnamon liqueurs, infusions, syrups, anything with cinnamon,” according to Colleen’s contest rules. This is the perfect opportunity to familiarize yourself with Original Cinn, the new 90-proof cinnamon schnapps from Hiram Walker whose praises I’ve been singing of late. Original Cinn has a versatile amount of uses: it is great in cocktails and hot drinks, perfect for shots, and also is delicious with desserts (pour a little bit atop some vanilla ice cream, I promise you won’t be disappointed). The best part of the cocktail contest is that it is open to everyone – from beginners to mixologists. So grab a bottle o’ cinn (it’s so reasonably priced at around $10 for a 750 ml) and stir up that perfect fall-flavored cocktail. Here is where you can enter the contest. Even over a thirty year span, Hiram Walker is still living in sin. Now, that’s not normally a way I would talk about a brand I actively work with, but in this case I think the statement holds true. Check out this ad circa 1978 that the Vintage Booze crew recently posted to their fantastic site. 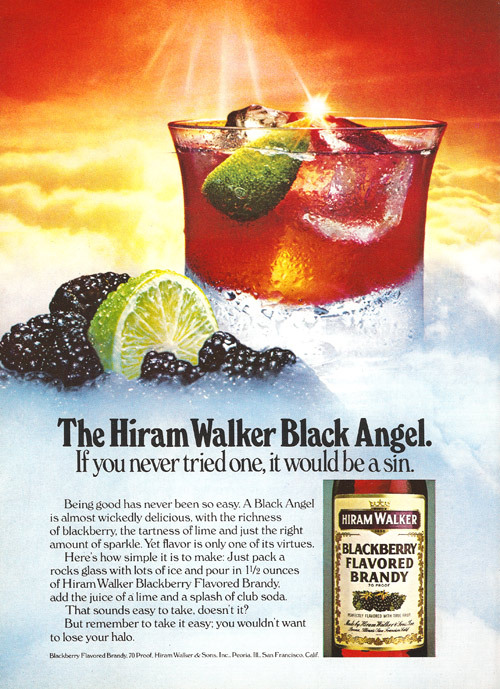 The ad is promoting a recipe, the Black Angel, using Hiram Walker’s highly desirable Blackberry Brandy. But, the way I see it, the gist of the ad is all about walking that fine line between naughty and nice. Ironically enough, Hiram Walker recently released a new 90-proof cinnamon schnapps, aptly called Original Cinn. Yeah, you see the play on words here: cinn, sin. But for me, the Cinn is not so much a sin, but rather, is a virtue to enhance the options for a cinnamon-flavored schnapps. It is not hot and spicy like many others on the market; instead, it boasts a subtle aroma of cinnamon, caramel, and vanilla that finishes sweet and smooth. While I have plenty more Original Cinn recipes in the queue, let’s for today stick with the sinfully simple recipe for the Black Angel, a la 1978. Pour the Blackberry Brandy and lime juice into an ice-filled rocks glass. Top with a splash of club soda and garnish with a lime wedge. Just like a bottle of fine wine, the Black Angel recipe seem only better with age.